The Quickie IRIS utilizes a rotational tilt-system. Instead of tilting the seat frame from an outside pivot-point the Quickie IRIS actually rotates the seat frame around the users center-of-gravity. 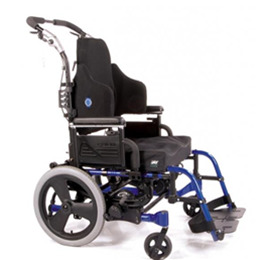 This rotational system provides the shortest possible wheelbase without compromising stability. It also insures a smooth and controlled rotation. The 60 Tilt Advantage The Quickie IRIS features three tilt ranges: -5 to 50 , 0 to 55 , and 5 to 60 . As the seat frame rotates past 45 , a significant amount of pressure transfers from the seat to the back. By providing up to 60 of tilt, the Quickie IRIS insures that the majority of pressure is removed from the ischial tuberosities. Built-In Adjustability The Quickie IRIS has extensive built-in adjustability. The chair frame can literally expand from 14" -22" in width and 15" - 22" in depth changing only four small parts. This vast range of built-in adjustability provides a precise center-of-gravity adjustment without replacing large frame-assemblies. Low Seat-To-Floor Height The new Zippie Iris features a 13 in. front seat-to-floor height.